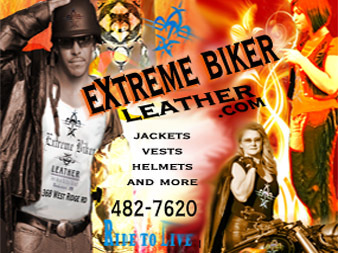 THANK YOU for considering shopping with Extreme Biker Leather. Leather traditionally runs a size small ! Ladies leather can run two sizes smaller – measure your chest size! Read the extra general info Mary wrote that explains best body types. STILL NOT SURE! PLEASE CALL THE STORE! right Leather apparel because we know what questions to ask. consider your body type, weight and measurements. Are you going to put your vest over your jacket? Do you like to put patches on your vest or jacket? Do you like collars or leather to touch your neck? Do you ride long distance? or night ride? Do you want a clean look or are pockets, etc ok? Do you like to wear heavy tops when you ride? Do you like black or brown leather? Braid or fringe? Ladies, do you like your lower back exposed when you lean forward? If you said no - than look for longer jackets. Do you care for your leather at the end of seasons? Full Face - never had one? look at a modular first - less closterfobic. **Measure your actual hat size this will help to find the correct fit. All the above will help to steer you to the right fit and leather for you! Ladies - when choosing your vest or jacket we have found that you will go up a size - due to the tops and shirts you wear. GO BY YOUR CHEST SIZE! I am a normal USA sixe 16 - XL, but in leather, I have to get 2XL .